The subject of not naming the shooter in a mass killing last came up in the TV Blog in June 2016. That was in the aftermath of the shooting at a predominantly gay nightclub in Orlando that left 49 dead (not counting the shooter himself). The TV Blog concerned itself with Anderson Cooper's declaration on CNN that he would refrain from uttering the shooter's name in his reports. He explained that this personal policy was based on his belief that repeatedly identifying him by name on CNN would award the killer with a notoriety he did not deserve. Moreover, Cooper felt that naming the shooter -- i.e., dignifying his existence with a name -- diminished or was even insulting to the memory of the 49 who perished at his hands and whose names deserved to be remembered far more than his. It was a noble sentiment and apparently within Cooper's power to declare and to practice (although if memory serves, this did not become the adopted policy of CNN generally). Here in the present day, the prime minister of New Zealand echoed Cooper's 2016 declaration when she vowed this week to refrain from naming the killer in the mosque shootings that killed “at least 50” worshipers (as the death toll is being referred to in news reports) last Friday in Christchurch. 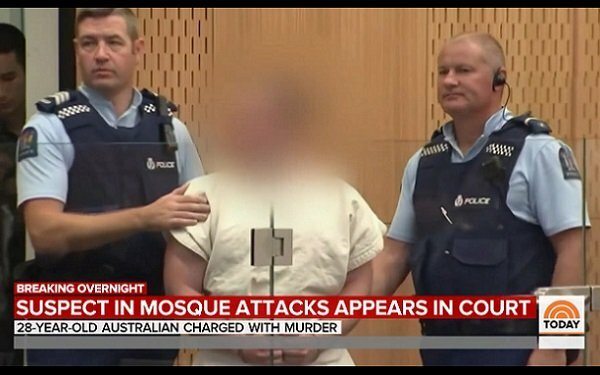 Viewers of the TV news coverage of the story have likely noticed that when the shooter appeared in a New Zealand courtroom, his face was pixelated so as not to be recognizable (as in the screen grab from “The Today Show” on NBC, above). According to the BBC, this pixelation had nothing to do with the prime minister's speech but with a judge's order that the shooter's face be obscured in photos and videos obtained in his court appearances “to preserve his fair trial rights” (in the words of the BBC). This pixelation order had nothing to do, apparently, with any wish on the part of the court or the New Zealand legal system at large to deny the man his notoriety -- which everyone assumes he craves and motivated him, at least in part, to carry out this attack. This is the core belief that animates these occasional declarations that revealing the name of this or any other heinous killer merely works to the killer's advantage for it grants him the fame that he so obviously seeks. When a public figure such as New Zealand's prime minister states an intention to refuse to name a shooting suspect in public, the implication is that the public figure wishes others to follow suit -- such as the news media, for example. This has definitely not happened in the case of this New Zealand massacre. Even in the stories about the prime minister's speech, the man -- Brenton Tarrant, 28 -- was mentioned by name along with a photo of his face. Whether it be the prime minister of New Zealand or Anderson Cooper and James Comey -- the then-FBI director in 2016 who also announced a policy to refrain from naming the Orlando shooter -- these gestures certainly seem heartfelt. But they are futile, of course. News media and social media today are too numerous to somehow keep Brenton Tarrant's name out of the public consciousness. In addition, the idea that a mass killer somehow benefits from all that exposure is debatable. Certainly, the killer himself might feel satisfied that he achieved his ambition to become world famous for some fringe cause. But these people are delusional anyway. For the rest of us, identifying a killer gives evil a face and a name. Rather than rewarding these people with fame, mass exposure rewards them with ill-fame. And where the news media is concerned, the question of naming or not naming comes down to standard practices in journalism. People have names, and names are facts. Since newspeople are in the fact business, keeping these people's names out of news stories is simply not appropriate. And this is why, Anderson Cooper notwithstanding, this just is not done.